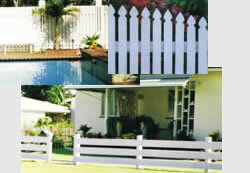 Pine and Hardwood Fencing Rails and posts can be cut to a variety of sizes and lengths. Pine palings are manufactured in a variety of lengths from 1.2m to 4.8m in 75mm, 100mm and 150mm widths and are produced in a batten and colonial top. All landscaping, fencing and building timbers can be CCA or ACQ treated (non arsenic) in our own plant if the customer requires it. 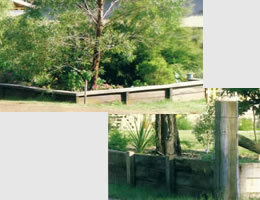 Landscape Pine and Hardwood Sleepers are manufactured in many sizes. Wade produce Pine Logs at their Gympie mill. Logs, in a variety of sizes and lengths, are manufactured with no taper and a smooth finish. Rural logs are also available. 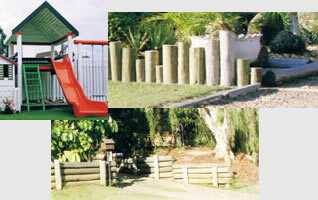 Wade Sawmill produces a large variety of sawn timbers for building, step treads and pergolas. Wade Sawmill recommends the use of treated timbers in all outdoor situations to prolong the life of the products. All treated timbers have a 40 year guarantee on the treatment. NOTE: Treated timbers MUST not be burnt!